Christ carried our sins in his body on the cross so that freed from our sins, we could live a life that has God's approval. His wounds have healed you. The word of God reveals that God is very interested in our welfare. 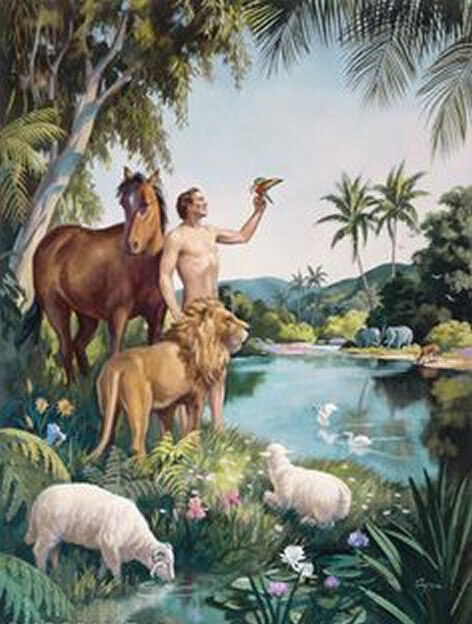 Then God said, “Let us make humankind in our image, in the likeness of ourselves; and let them rule over the fish in the sea, the birds in the air, the animals, and over all the earth, and over every crawling creature that crawls on the earth. So God created humankind in his own image; in the image of God he created him: male and female he created them. God blessed them: God said to them, “Be fruitful, multiply, fill the earth and subdue it. Rule over the fish in the sea, the birds in the air and every living creature that crawls on the earth.” Then God said, “Here! Throughout the whole earth I am giving you as food every seed-bearing plant and every tree with seed-bearing fruit. And to every wild animal, bird in the air and creature crawling on the earth, in which there is a living soul, I am giving as food every kind of green plant.” And that is how it was. God saw everything that he had made, and indeed it was very good. So there was evening, and there was morning, a sixth day. There is much to say about this, but in summary form we see several important points. We are created in God’s image and likeness. The Hebrew wording paints a picture of us being like a carbon copy, a model or like a lifelike statue of some kind. God is a spirit, so we are spirit beings. God is a tripartite God, that means three persons, God the Father, God the Son and God the Holy Spirit and this is a major topic in itself. We are thus a tripartite being, comprising the spirit, our soul which is where the mind will and emotions function and a physical body. Man was created to basically live forever, without sickness or death but when what is called original sin came in, everything changed. God had forbidden man to eat the fruit of the tree of the knowledge of good and evil in Genesis 2:16-17, saying that if he did, he would die. When Adam and Eve ate that fruit, from that point onwards, mankind changed from living in a state of perfection to a state of incipient death. Sickness came. We should never get sick, but we do. God blessed Adam and Eve. This reveals that we are designed to live in that blessing. John reinforces this in 3 John 2 where we see that we should prosper, be in health and our soul life prospers. Prosperity is not only money and possessions, but a complete lifestyle. We are supposed to be fruitful, multiply and live as the dominant species. God provided all kinds of food, that in the original design, our food source was in the vegetable kingdom. Later God gave clear instructions as to what kinds of food man could eat and this included meat. A good balanced diet is revealed throughout scripture. Our presentations take on more than one aspect. God's intentions for us are very clear & unambiguous. I am writing to Gaius, my dear friend, whom I love in the truth. Dear friend, I hope all is well with you and that you are as healthy in body as you are strong in spirit. Some of the traveling teachers recently returned and made me very happy by telling me about your faithfulness and that you are living according to the truth. I could have no greater joy than to hear that my children are following the truth. 3 John 2. Several times in his opening statement, he mentioned truth. Our studies are designed to reveal the truth regarding health and healing, summed up simply by stating that healing is part of the atoning work of Jesus Christ and that all of our diseases were dealt with on the cross as part of a package deal which includes atonement for sin and the removal of the results of the curse. The matter of Divine Healing has been a contentions issue for generations and it need not be so. Scriptures clearly reveal God's will and plan for mankind. It is very simple. God's intentions for you and for me are to live well, and live in a manner that gives Him glory. Pain, sickness and poverty do not exist in Heaven and never existed in the Garden. Those things are a result of the curse and Jesus redeemed us from that curse. The Suffering for Jesus and similar doctrines, may sound noble but are plain stupidity and are a lie from hell. Anyone who maintains that we have to suffer is a fool. If pain and suffering give God glory then why visit a doctor to obtain help? That is pure stupidity. If what they maintain is true, then my advice is simple... get sick. Get real sick, because the worse you are, the more glory you give God! If you obtain help from a doctor, then, according to this belief, you are rebelling and in fact causing that doctor so sin against the will of God. Think about it. You may answer, That makes no sense Robert. I agree with you, because it is not what God's word says. Additionally, if you believe that sickness or poverty comes to teach you, then you are telling Jesus that He is a liar! But the Comforter, which is the Holy Ghost, whom the Father will send in my name, he shall teach you all things, and bring all things to your remembrance, whatsoever I have said unto you. John 14:26. See also John 15:26. I apologize if I have touched someone's sacred cow here, but the truth of the Word of God cannot be denied. The points I wish to make are that God has given us everything possible to ensure we live the way He intended, but if we do not know, then we are gullible enough to fall for anything and in this instance, the outcome is sickness and disease. Hoses 4:6 says that God's people are destroyed for lack of such truth. The purpose for my studies and messages is to reveal the truth so that you can make an intelligent decision, based on fact, not on emotion or religious tradition. I believe in the ministry of healing. I also believe in medical science and living healthy lifestyles, with appropriate exercise, correct diet and nutrition, fresh air, drinking clean water, personal hygiene etc. In fact the bible advocates all of these things. Every account I read about the ministry of Jesus reveals that healing people was an integral part of His ministry. He also commanded us to do likewise. As you go, spread this message: ‘The kingdom of heaven is near.' Cure the sick, bring the dead back to life, cleanse those with skin diseases, and force demons out of people. Give these things without charging, since you received them without paying. Matthew 10:7-8; Luke 9:2. And heal the sick that are therein, and say unto them, The kingdom of God is come nigh unto you. Luke 10:9. Please notice the mention to the Kingdom of God. This refers to God's ways of doing things, so it is evident that one of God's ways of doing things is to make sure that people have the ability and opportunity to live well and long on the earth, freed from the fear, pain and suffering of disease. Medical science. One of our Gospels was written by a doctor... the Physician Luke. The Gifts of healing according to scripture. All five items listed above are good and valid. I believe in them and use all of them as appropriate. Please do likewise. This series of studies focuses on the Healing Ministry of the New Testament Church in its various applications from a doctrinal point of view; the practical applications like praying for the sick, laying hands on people, anointing with oil and exercising the Gifts of the Spirit. We also touch on the practical aspects of living well. This includes proper diet and nutrition, exercise and hygeine. We can pray and receive a miracle of healing but God expects us to play a part. That part involves all of those practical aspects. Both the spiritual and the practical are involved. Elsewhere on this site we shall touch on food, medication and allied aspects. I hope what I share blesses you, encourages you and helps you.